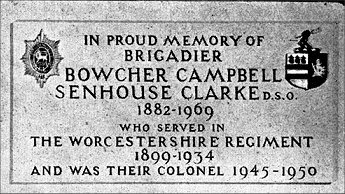 Brigadier Bowcher Campbell Senhouse CLARKE, D.S.O. Commanded the 4th Battalion Worcestershire Regiment from November 1917 to September 1918. Commanded the Depot Worcestershire Regiment from November 1923 to November 1926. Commanded the 2nd Battalion Worcestershire Regiment from November 1929 to November 1933. Bowcher Campbell Senhouse Clarke was born 19th April 1882. Bowie Clarke (as he was Known) was in every possible sense a true son of The Worcestershire Regiment. At the time of his birth his father, Colonel William Senhouse Clarke, was serving in the Worcestershire Regiment, having in fact been one of the last officers to obtain his commission by purchase in the old 29th (Worcestershire) Regiment. His father joined the 29th Regiment in Canada in 1868 and served continuously with that battalion until he had completed his four years in command of it in 1899. On his mother's side he was connected with the Ensign Vance who died saving the Colours of the 29th Foot at Albuhera on 18th May 1811. After leaving Wellington College, Bowie Clarke went very shortly to serve in the South African War (of which he was the last surviving Regimental officer) and after that war he served at Regimental duty in Ireland, South Africa again, Ceylon, India and Aldershot. Bowie Clarke was educated at Wellington College, he was gazetted as Second-Lieutenant to the 4th (Militia) Battalion, The Worcestershire Regiment, on 1st June 1899. Promoted Lieutenant in 1900, he served at Aldershot with that Battalion, which was then embodied on account of the war in South Africa. In 1901 he went to South Africa, attached to the 5th Battalion, The Manchester Regiment, and a few months later joined the Worcestershire Company of the 5th Mounted Infantry Regiment, which was then operating in Cape Colony, Orange River Colony and Griqualand. He received a regular commission for services in the field and was gazetted as 2nd Lieut. to The Worcestershire Regiment in January 1903, and joined the 3rd Battalion Worcestershire Regiment at Tipperary. That same year he was posted to the 2nd Battalion and returned to South Africa, where he joined the Battalion at Bloemfontein in the Orange River Colony. He was sent to rejoin the 5th Mounted Infantry Regiment and served with them at Kroonstadt in the Orange River Colony, and afterwards at Middelburg in the Transvaal. At the end of 1904 he rejoined the Battalion at Durban with the Mounted Infantry Company and embarked for Ceylon where he remained for the next two years. Promoted Lieutenant in 1906, he moved with the Battalion to India at the end of that year, and served at Ahmednagar and Jhansi for the next six years. In 1912 he was appointed Adjutant of the 2nd Battalion Worcestershire Regiment. In 1913 he returned to England with the Battalion and was stationed at Aldershot until the outbreak of war in August, 1914, when he proceeded to France as Adjutant. In September 1914, he was promoted Captain. "The rally of the 1st Division and the capture of the village of GHELUVELT at such a time was fraught with momentous consequences. If any one unit can be singled out for special praise, it is the Worcestershires." In February 1915, he received a Brevet-Majority for distinguished service in the field, and was promoted substantive Major in May 1917. In November 1917, he was promoted acting Lieut.-Colonel and assumed command of the 4th Battalion in the 29th Division, remaining in command of that Battalion until September 1918, when he was invalided home. His name is so closely associated with Gheluvelt that one tends to overlook his outstanding service in the remainder of the Great War. 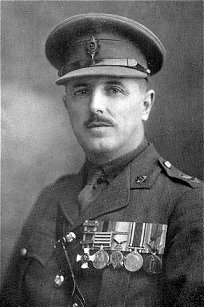 In each case as a Regimental officer—mostly, either as Adjutant of the 2nd Battalion, or, from early 1917 as Commanding Officer of the 4th Battalion, he took an active part in eighteen other major battles, all of which were subsequently awarded as Regimental Battle Honours. For his war services Bowie Clarke was three times Mentioned in Despatches, awarded a Brevet Majority and the Distinguished Service Order and Bar. In 1919 he proceeded to Germany in command of the 53rd (Young Soldiers') Battalion, South Wales Borderers, for the Army of Occupation. At the end of 1919 he joined the 3rd Battalion at Dover and proceeded with them to Dublin. He went to India with the 3rd Battalion and served at Bareilly and Barrackpore. He was then attached to the Staff of United Provinces District as Acting D.A.A.G. and afterwards appointed G.S.O.3 at Meerut. He joined the 2nd Battalion in 1922 at Dublin and moved with them to Dover. From November 1923, to November 1926, he was in command of the Depot. In January 1927, he rejoined the 2nd Battalion on the Rhine as 2nd-in-command, and moved with the Battalion to Plymouth two years later. He was promoted Lieut.-Colonel in November 1929, to command the 2nd Battalion. After a year in command at Plymouth he took the Battalion to Malta, where he completed his four years' command. Promoted in 1934 to command a Brigade of the Territorial Army, and after the outbreak of the second World War in 1939 to Aldershot Sub District, he retired from the Active List in 1942 after forty-three years' distinguished service. But his life as a soldier was not yet over. In 1945 he was selected by His Majesty The King to succeed the late General George Grogan, V.C., as Colonel of this Regiment. When he vacated the Colonelcy in 1950, his successor, General Sir Richard Gale, saying in a speech "That to be in turn Adjutant, Commanding Officer and Colonel of the Regiment is the height of ambition of the true Regimental Officer." In the many remaining years of his life his service to his Regiment was unabated, giving himself unsparingly in his work for the Regimental Association, being a Vice-President from 1948 and President from 1955 until a few months before his death. Brigadier Clarke died at Cheltenham on the 16th January 1986 at the grand old age of 86. The Memorial Plaque opposite, which was designed by his old friend Brigadier Donald Nott, was unveiled by Mrs. Senhouse Clarke in St. George's Chapel, Worcester Cathedral, in a short but moving ceremony on the morning of Saturday, 27th June 1970, as The Regiment's last tribute to a man who, throughout his long and distinguished service, was universally respected and loved. "We are gathered in our Cathedral Church today to commemorate the life of, and to dedicate a memorial to, a man greatly beloved." 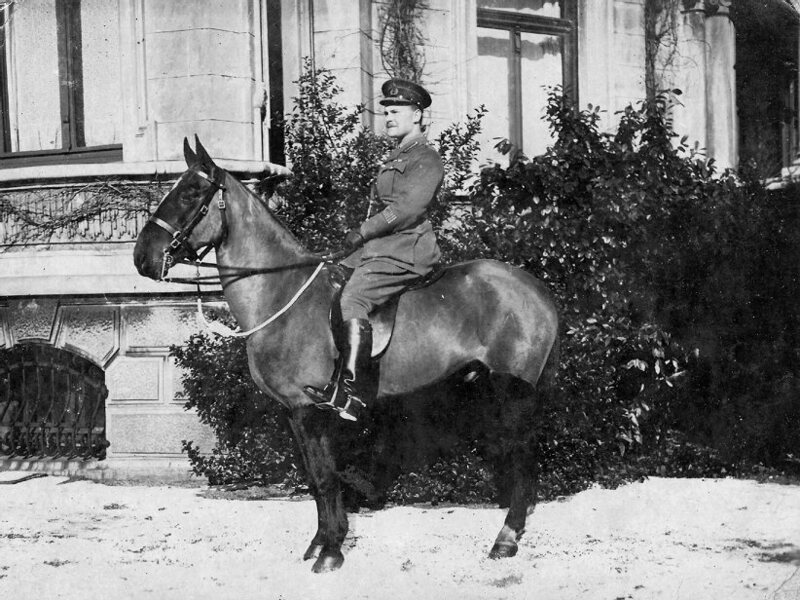 Bowcher Campbell Senhouse Clarke on his horse "charger"